There is good news for people who love eating chocolates. In a recent study that was published in British Medical Journal and presented at the European Society of Cardiology’s conference, it was stated that regular consumption of chocolates can reduce the risk of developing heart problems. The study was conducted at University of Cambridge by Oscar Franco and his colleagues who put to test the studies that were previously conducted to find out the connection between heart disease and chocolate. They tested the results of previous studies and reviewed the data they had to check the reliability of claims made by researchers. 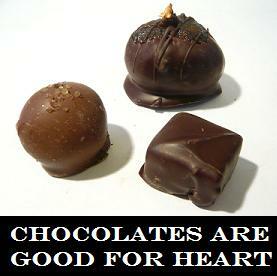 According to Oscar Franco the test made on previous studies established the link between chocolates and heart disease. The researchers tested the results of 7 studies that involved about 114,000 participants. When they pooled the results of the study they found that people who ate chocolates had a 37 percent less risk of developing heart disease when compared to people who did not eat chocolates. Researchers also found that people who ate chocolates had 29 percent less risk suffering from stroke than people who ate fewer chocolates. However, researchers found no connection between heart failure and chocolate intake. The study conducted by researchers at the University of Cambridge did not differentiate between sweeter products like cookies and snack bar and dark chocolates. Oscar Franco further added that this study should not be used as an excuse by people who increase their intake of chocolates. He said that most chocolates that are available in the market have high fat and sugar content which can lead to weigh gain. Increase in weight of people can put strain on heart and increase the risk of other health problems. Franco added that eating chocolate in moderate amounts can reduce the risk of heart problems without increasing your weight. One of the main reasons why chocolates are considered good for heart is because it contains antioxidants and polyphenols that improve the production nitric oxide in the body.